MISSOULA, MT--(Marketwire - February 1, 2010) - At Blackfoot Telephone Cooperative (Blackfoot), being a good corporate neighbor is a longstanding business practice. They achieve this through their willingness and desire to be a part of each of their 22 service areas in Western Montana -- through charitable contributions, in-kind donations, event sponsorships, and educational initiatives like their Scholarship Program for graduating seniors. 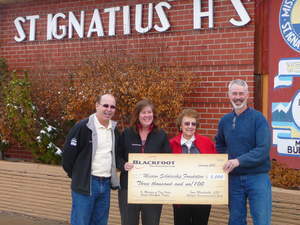 Blackfoot continues to be supportive in many other programs such as the Easy Access Internet Training for senior citizens, the Blackfoot Technology Tour for high school students and their EEE Program that donates technology equipment to rural secondary schools. On Wednesday, January 27, 2010, Blackfoot CEO Joan Mandeville along with Isabelle Seery and current Trustee Stuart Morton presented the Mission Scholarship Foundation (MSF) with a check for $3000 to honor Dan Seery's memory by helping to provide initial funding for the Foundation. Mandeville commented, "It has been an honor to partner with the Mission Scholarship Foundation. Together, we can brighten the future of our local youth and help them fulfill their true potential. I think Dan would be very pleased by this gesture because of his generous spirit in both his personal life and in his role as a Trustee of the Blackfoot Cooperative for 20 years." Receiving the check on behalf of the Foundation was local superintendent of St. Ignatius Schools and Foundation Chair Gerry Nolan. "I just want to say thank you to Blackfoot Telephone. The generous contribution will be used to provide Mission High School graduates with post high school educational opportunities for years to come. Blackfoot is a great community partner. We appreciate their generosity as well as the generosity of the Seery family," commented Nolan. For more information on how you can help youth in St. Ignatius access higher education and greater opportunity, visit their site at www.missionscholarshipfoundation.org. To apply for a Blackfoot scholarship, download an application at www.blackfoot.com. Blackfoot: Partnering Locally. Named after the Blackfoot River running through much of the territory it serves, the Blackfoot Telecommunications Group(Blackfoot) was originally established in 1954 as Blackfoot Telephone Cooperative. Blackfoot offers state-of-the-art telecommunications, Internet and data solutions to customers in Missoula and throughout Montana and Idaho. Headquartered in Missoula, Montana, Blackfoot employs more than 150 Montanans. Blackfoot can be reached at 406-541-5000 or through its web site at http://www.blackfoot.com.